While traveling through the Alps my suspicions were confirmed through various sources – this has been the worst summer weather in years! 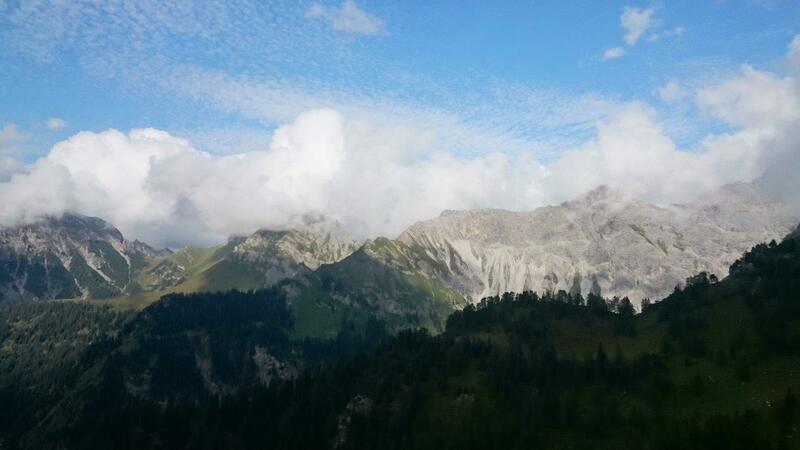 Nevertheless, you should never describe the Alps as having a reliable climate, and one must roll with the punches. I managed to cobble together some great flights as I travelled across and around Switzerland, through new and familiar places. My travelling blog describes the road trip with my brother and walking trip with my mates, here I’ll show a few more flying photos and talk about the weather. After heavy afternoon showers the previous day, the sky dawned blue. The moisture and instability allows an early morning start in the Swiss Alps but I was far too late. Having said that I still had a good flight, making easy mileage down the Rhone valley until getting a bit indecisive at the Zermatt valley junction, wondering if I should try to fly over Simplon pass. 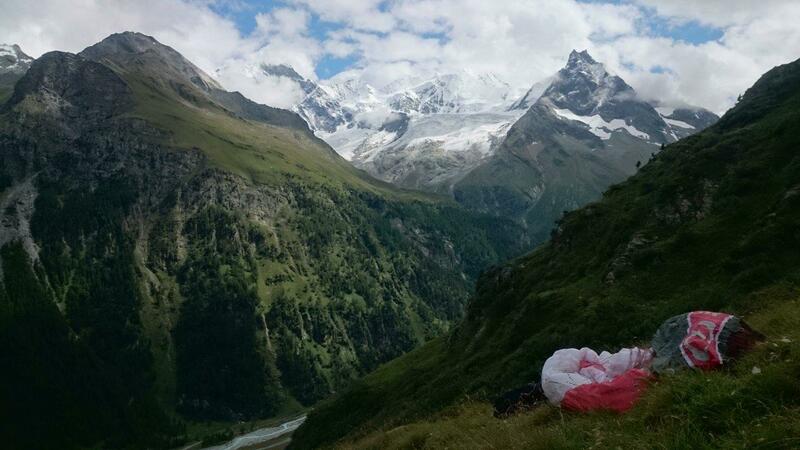 I was a bit lax as I glided towards Zermatt so I got low and fell back onto a small cliff just above the Saaser Vispa valley floor. Finally my patience paid off and I got up high enough to push in front of the valley wind and land high. Here I was again lax, lazing in the grass while I watched another glider (only one I saw on this side) climb out in front of me. Half an hour later the wind had changed and was firmly over the back. I was surprised at the time but I think this makes sense as the arrival of a valley wind from Italy over the Simplon pass. The evening had deteriorated anyway with the cloud build up dispersing and spreading. 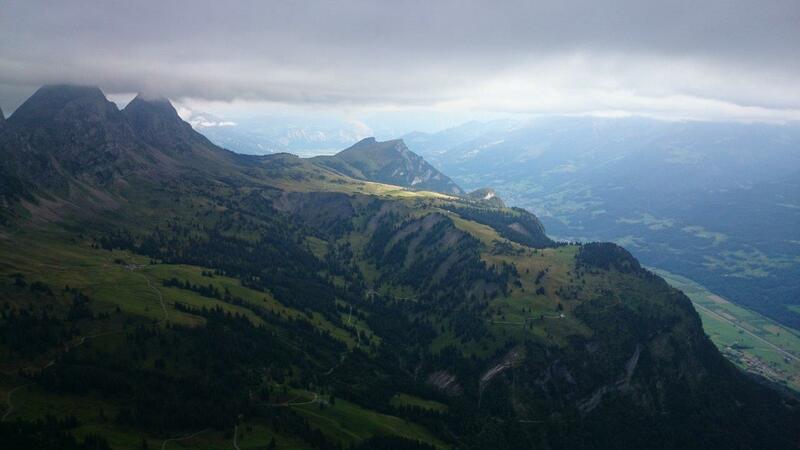 I took off in a strong wind, soaring up and deciding to push into the head of the valley toward Simelihorn. It was possible to soar this wind even though it didn’t seem like it should be. After top landing I was cheeky and tried to push over the ridge toward Italy but got punished – I didn’t dare slope land as I plunged downwards. Full speed back to the windward side and I made a full recovery. With low cloud burning off in the morning and big shower bearing clouds bearing in the afternoon, I wrote the day off for flying but at the last minute changed my mind. I rushed up the Vogel lift and spent more time chatting to the young like minded tandem pilots than actually flying. The flight was good though, got a nice thermal and explored various corners of the mostly shaded area. As the afternoon showers became established we drove over the pass to Tolmin. The following day was better with a progressively drier atmosphere. 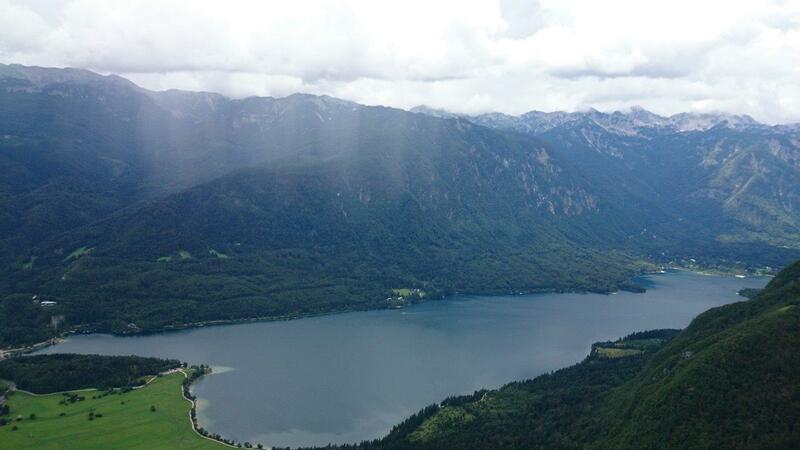 I enjoyed a hike and fly, flying over limestone cliffs before pushing out to land at the Tolmin landing field. Nothing special to report, a longer flight was possible with only isolated storms that afternoon but I was happy with the day. I didn’t leave it too late this time but still I had a pretty good climb from around 10am in the morning. 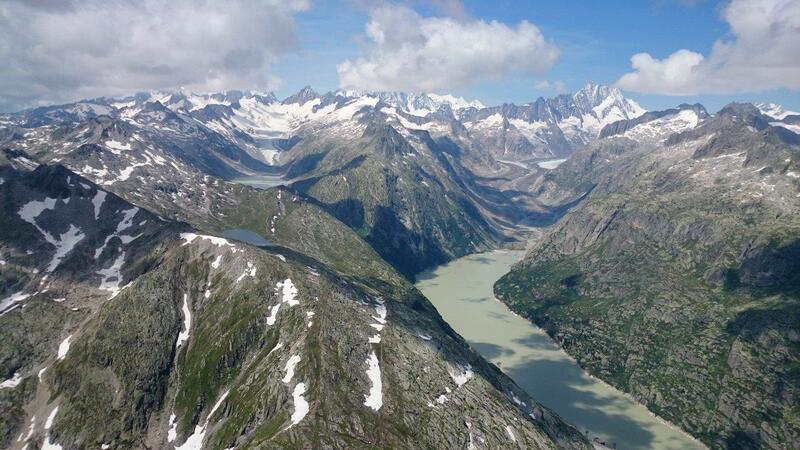 A fantastic place to fly, the southeast aspect of Val Ferret (near Courmayer) with morning sun and sheltered from the westerly blowing over the top. I was at a loss as to which way to go, eventually having an easy ride over the Ferret pass into Switzerland for a look before turning around. The air wasn’t quite the same on the Swiss side and after much time spent trying to soar up near Col Ferret I eventually had to land to get over the pass. The wind was coming across quite strongly from the Italian side, with the boundary to the Swiss valley side somewhere near where I landed, perhaps 3-500 metres from the pass. 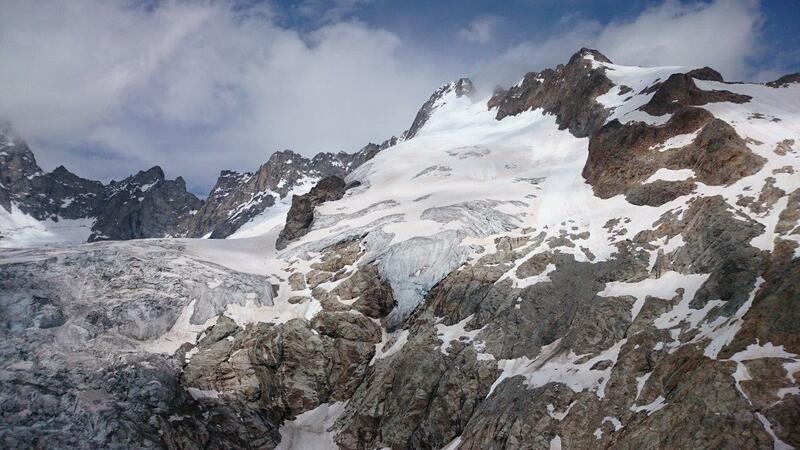 It was a great ride up from the pass, no need to turn in the dynamic lift, instead head straight for the glacier. 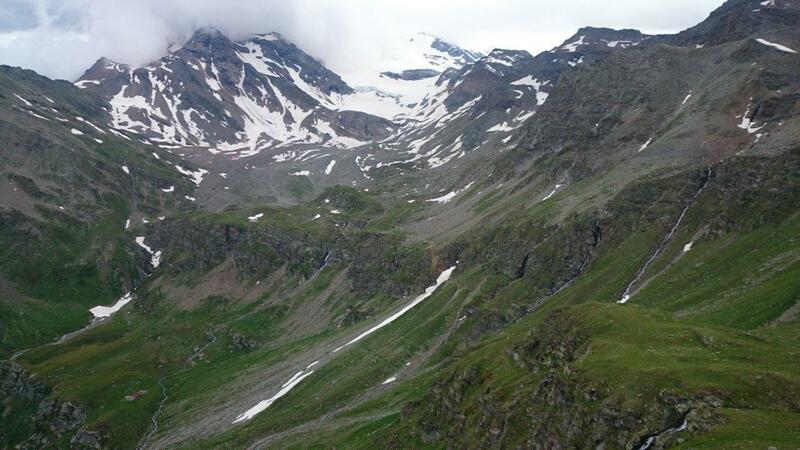 In no time I’d thermalled up over the glacier, waving to the guys in the hut, and started pushing into wind back towards Courmayer and France. It wasn’t easy to push into the valley wind except for the fact that you could get incredibly high on each rocky spine before pushing bar to the next one. It was pretty amazing soaring these famous ridges. 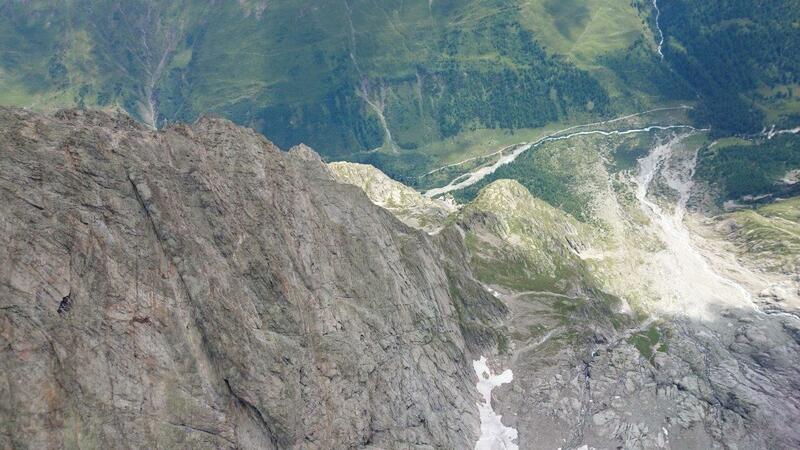 I think it was the Grand Jorasses, an almighty wall of solid rock, that had a lone vulture perched on top. As one might expect there was some turbulence as I passed behind the cliffs of Refuge Monzino, I had plenty of ground clearance but it was still good that the LM5 behaved itself (but definitely required active flying!). Optimistically I tried soaring the other side of the valley but really didn’t expect much and my crabbing descent to the valley floor was decisive. On 5 August cloud base hovered around 2500 metres but it started working so early in the morning that I enthusiastically added a large detour to my route “on the fly”. It was a really enjoyable flight and only more satisfying when we had light showers in Chamonix an hour or two after landing. The next day was stable, an absolute anomaly compared to the rest of the time here. 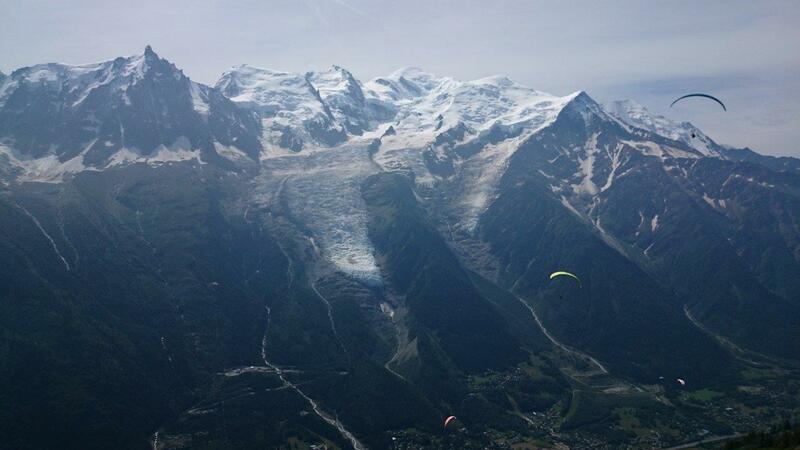 I flew Brevent after midday, getting above the ridge but only for a while. As the afternoon valley wind got established and the sky faded with cirrostratus I got lower and lower, despite my efforts scratching and pushing further up the valley I ended up sliding back to the Brevent landing field. 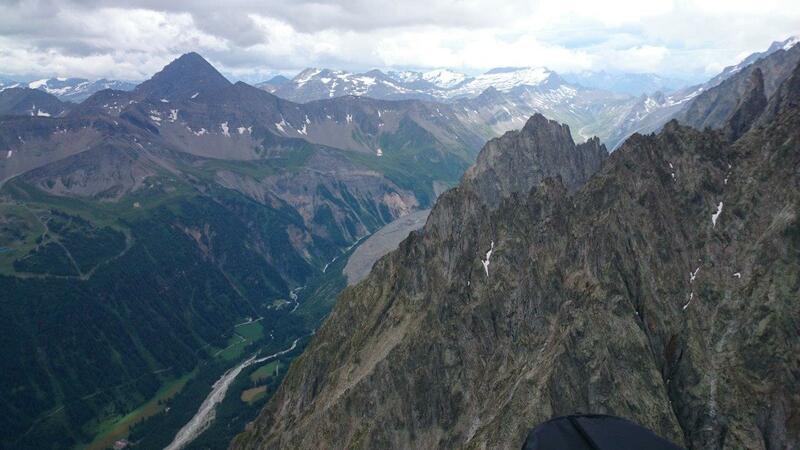 On 7 August I flew from Grand Montets. Having taken the lift up it felt somewhat removed from “reality”, although I was familiar from those altitudes from just a few days before. Only needing a glide to get to La Balme I spent the afternoon top landing and trying a few spots in the valley to get up high, but spent most of the time waiting as it clagged up and there was very little sunshine. 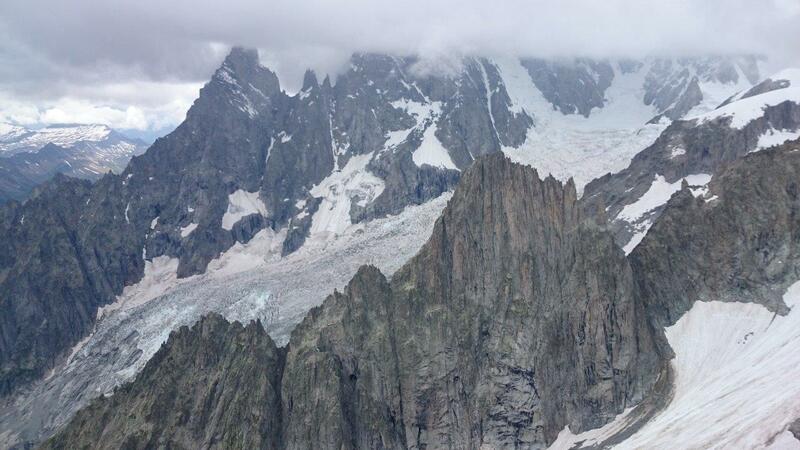 A high glide from the Triente glacier and I popped through La Genepi pass and made a pass along a SE facing ridge. It was very odd to pass without lift, I got a weak climb before trying the other side, getting a climb on the ridge above Champex / Orsieres. 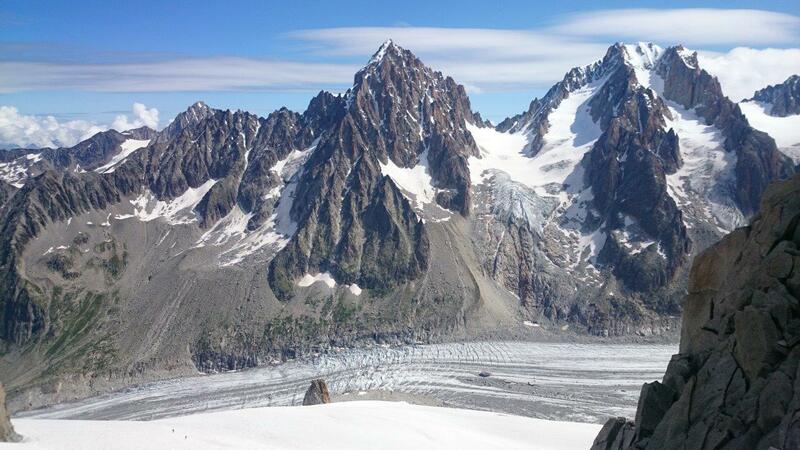 Admiring the glaciers pouring from Auguilles Chardonnet and Argentiere I met rough air (upper west meets valley breeze influence I imagine) but still no decent lift. I crossed the valley, intending to fly a loop towards the Italian border and back, but despite how it looked the day was quite stable and I had limited success. Retreating I was battered low on sun facing cliffs in the lee of the valley wind. The roughest air I’d been in in a while so I made sure I had plenty of terrain clearance. I kept going back to Champex and had a chance to land there but was greedy and kept going, finally decking it in Orsieres. Finally a clear morning in Switzerland. Well, clear enough, there was fairly low cloud, and it was so cold! A nice flight up the valley, not far, experimenting with new ways to keep the hands warm, nothing really special to report about the weather or the flying. With showers coming and going and low cloud above, below, and on launch I finally decided to give flying a go anyway. To start with I flew through a prolonged sink cycle, then I found a small spur tucked around the corner where I could scratch and eventually gain some height in the super unstable conditions. I slope landed in the lee of the spur and was going to walk back up but then decided I could fly again. 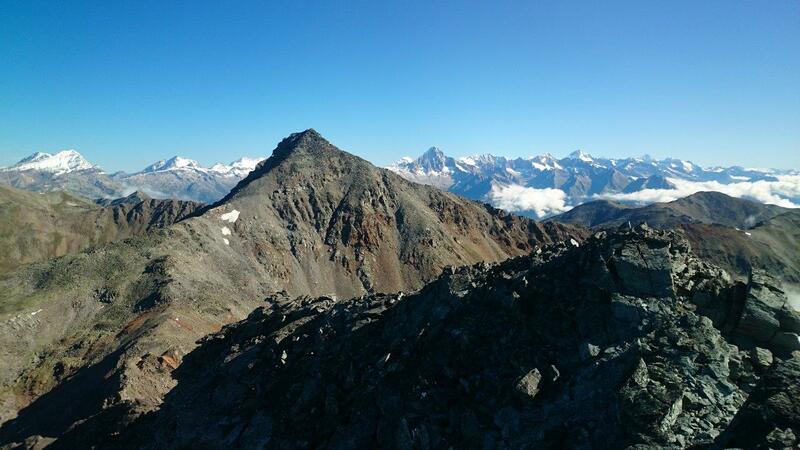 I returned to the same low spur and scratched until I got a good climb and met the wind again. Boisterous air quite like a washing machine as the air was very unstable. But there was so much cloud that the aerology was still very local. In the end I landed without much room to move as it seemed there was overdevelopment from the associated cloud – more showers came and went in the afternoon. Like the last few days the weather was extremely cold. There was a significant morning snow shower which whitened the ground for a while until the sun came out again. 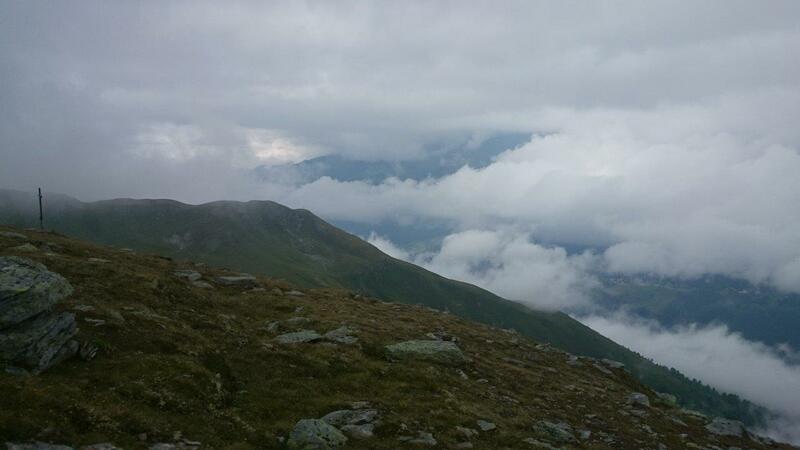 I took off from the high pass, nudging on 3000 metres at a similar height to cloud base. Although the wind was light the ride to the edge of the hanging valley was bumpy and sinky in the lee. I skirted the head of the valley above Gruben and after some soaring I slope landed to wait for better conditions (still cold hands). After several hours I was in the shade, so I took off and glided through the still air until I met the sun above Gruben. Quite a dramatic change here as I met the valley wind, but I kept it together, gained height on the sunny spur, and caught a thermal up to the tops. The northwest wind made XC difficult and after trying to exit into the main Rhone valley I settled for a slope landing. It was late in the day but I thought it may have been possible to push out and take a downwind run to Fiesch before nightfall. The weather was finally coming good! A solid frost on the bivvy bag at 2350 metres and I reached the Augstbordpass before 9am. Gave me time to climb around the loose rocky peaks in the vicinity. There was a west wind blowing but back on the pass by midday it had died away to nothing. I’d considered launching back into the Gruben valley and flying into the Rhone but with nil wind I decided to fly directly into the Zermatt valley instead. Unfortunately the rocky launch claimed a victim on my first nil wind launch attempt – a small tear on the wingtip line attachment and a couple of lines. I flew anyway. In the sheltered air on the peaks just NE of the pass I found a good climb up to cloud base, not much higher than 3000 metres. I thought I better try flying into the Rhone. A long crossing and about half way with a significant sideways drift I changed the plan. 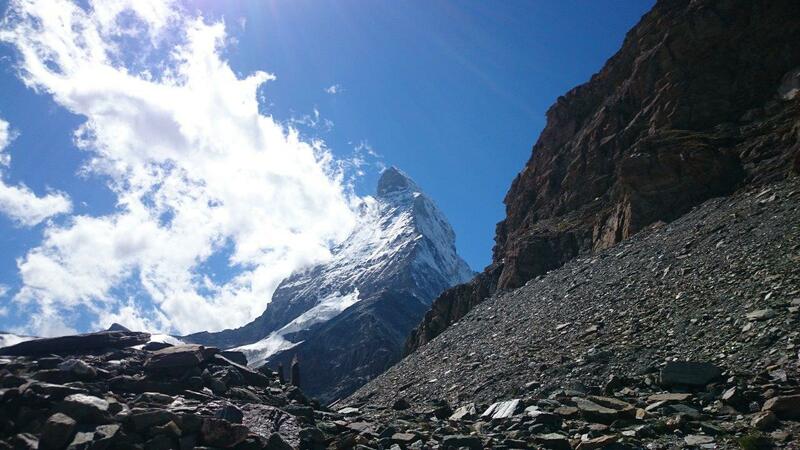 With high groundspeed I flew back into the Zermatt valley, much lower than I could have been. I found some lift on the way but gradually lost height as I approached St Niklaus. The aerial cables, hard to spot, were hazardous obstacles and in the end I gave up scratching on sunny cliffs in the valley wind because it was too stressful with the invisible cables to continue. Strong upper westerlies continued, although it was interesting to note that on the previous day the local tandems could fly until 1:30pm even though it was howling over the back at the Schwarzsee on the way to Hornli hut and the Matterhorn first thing in the morning. After the thermic part of the day it was also possible to fly in the valley. On the 19th in the morning it rained, giving a good excuse for a sleep in. I even spared some time to fix my lines while waiting for the cloud to lift to 2700 metres, where I’d stashed my glider 1000 metres above Zermatt. The flying was good, probably a little rougher than normal with the upper westerly influence. Half way down the valley I elected to cross the valley. I’m not sure if it was due to the winds aloft or simply to avoid the St Niklaus cables! I made good progress although cloud base got lower the closer I got to the Rhone. Finally there was something hinting at convergence on a small side valley crossing, a sign that things were about to change. I lost significant height afterwards and only just managed to clear the Grachen plateau, finding myself in front of the same spur between two branches of the Vispa valley as on 25 July. Like then I crossed back into the Saaser branch and even scratched up on the same rocks. With a bit more sun this time I gave myself leniency and explored a bit more widely for lift. Poking around the sunny side of the spur in the valley wind lee it became very turbulent as I got higher so after pushing forward a bit I elected to land. There was no hint of the rough air when I was on the ground but there was some definite mixing going on based on my experience in the air. Not in the greatest hurry but I decided it would be best to relaunch nearby, on the windward side of the valley wind. Passing through the village of Reidji a man with two sons who flew asked me where the landing place was. I replied that I was more concerned with finding a suitable launch at this stage! Indeed it was a very fickle launch, with the gusts really having a down slope component. After mapping out the village power lines in my mind in case I couldn’t clear the trees in front I took off and just managed it. Not something you want to repeat too often. The near vertical valley wind facing slope wasn’t working. In fact I think the Italian wind was influencing things again, as I continued toward the main valley to find a climb off the spur. As I got higher I pushed in to successively higher spurs toward the mountain. Soon I was cruising past the place I’d top landed the previous month. Here I soared the westerly coming up the Rhone. The previous time I’d flown this valley it had been full of paragliders and sailplanes, but this time I didn’t see anyone. It was late and with 80km/h ground speeds I have to admit it didn’t really feel like a proper cross country. But I’ll take it. After soaring a few ridges on the way, usually with slight penetration at trim speed, I top landed behind Fiesch on a spur with wind diverging either side of it. 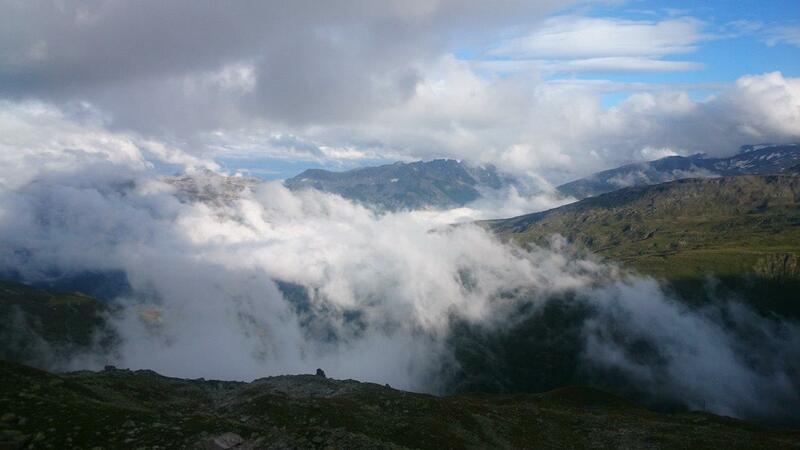 In the morning I was mostly walking along the ridge in cloud. The occasional glimpses into the valley gave me the idea of taking a sled ride into Fiesch and buying some gloves and getting my glider fixed with something better than dental floss and a tolerance of flapping bits. But instead I glided across the valley and worked the sunny spurs. 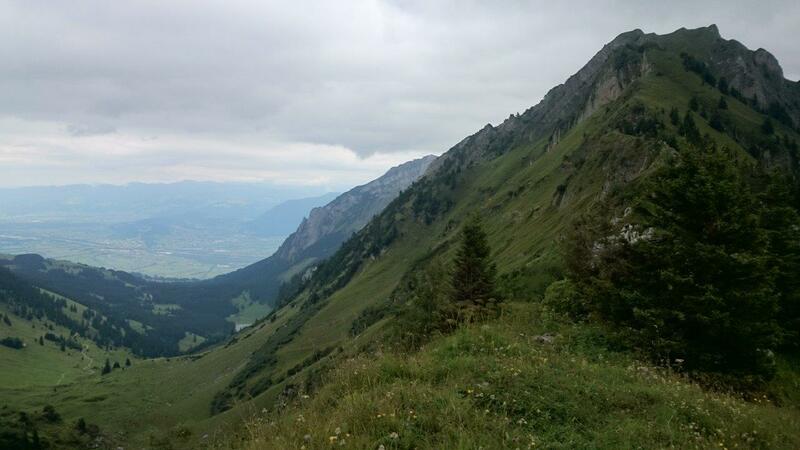 There wind helped push me to my destination at the head of the Rhone valley. I probably could have slope landed up high to avoid being flushed by the Grimselpass, visible as cloud poured into the Rhone. I thought I might have found a climb on the other side but it was not to be. Instead a long walk rounded out the morning, and as I sidled around to the Furkapass in the afternoon the humidity of the atmosphere had concentrated itself in big clouds to great heights above the Bernese Oberland massif and the Italian mountains to my south. Soon after I reached the Furkapass the cloud which had been spilling over reversed direction, perhaps associated with the showers from the west. 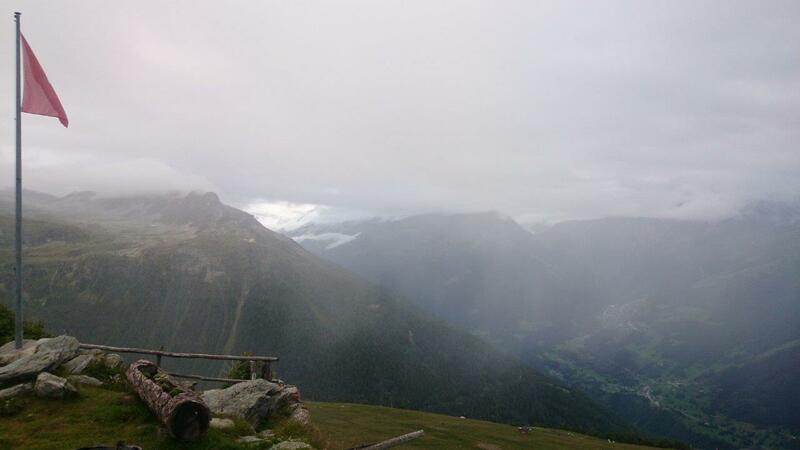 The snow showers later spilled over as I ate soup at the Sidelenhutte in the late afternoon. In the evening the winds from the west cleared out the cloud on my side of the Furkapass and I even considered flying and finding a camp somewhere on the Italian border. It was a little depressing to wake engulfed in cloud but to be fair I was above 2500 metres and soon enough it wafted to the side and I had some sunshine for a while. Most of my morning walk on the “Nepali highway” was in thick cloud however. I got to an early launch on sopping wet grass and started thermalling down the valley. I made it over an array of high tension power lines by the skin of my teeth (I can tolerate the wires which I can see!). Then with the cloud quite low still I decided not to take the Swiss highway past Oberalppass (2044 metres), instead having a look at the valley that led to Altdorf. I made sure I was high enough to cross over the power line filled gorge and then continued with a wonderful flight north. 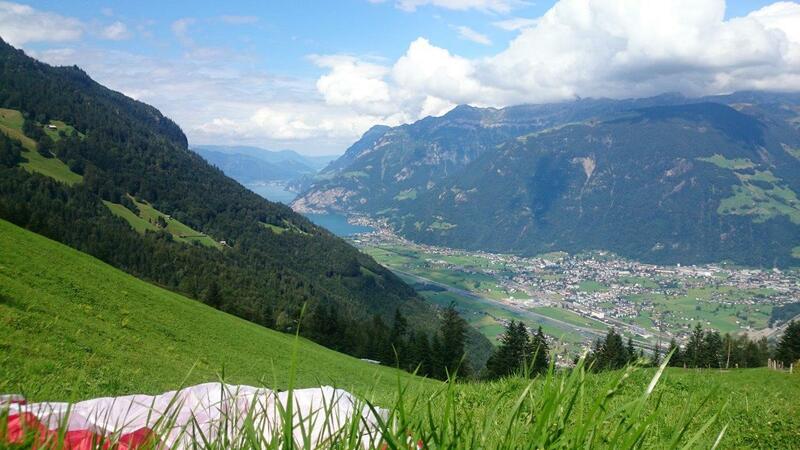 I was treated with beautiful views of secret Swiss valleys on either side as I climbed on sunny cliffs before the valley wind could get established. Clouds were significantly lower to the north so at times I was able to pass above or around them on glide. When I reached Altdorf I slope landed high to check my phone and internet to decide whether I should continue to the west towards Engelberg or if I should follow the via alpina walking route east. When I relaunched the valley wind arrived in force and I lost most of my height trying to push in front of a spur. 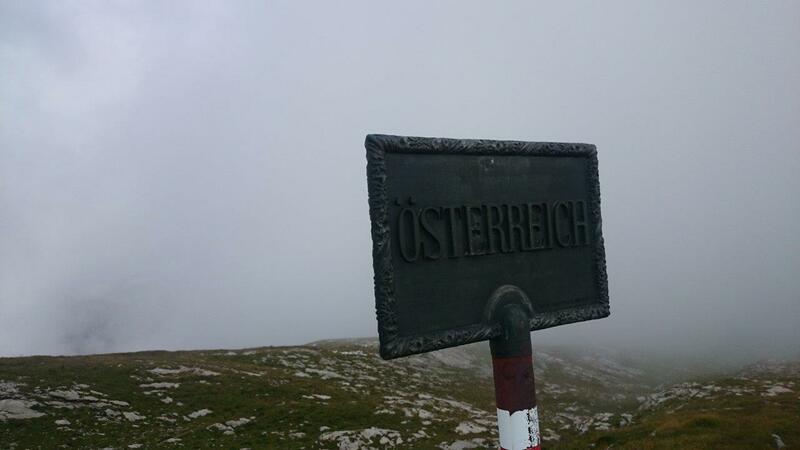 I decided to walk up again instead of descending into Altdorf by foot. Relaunching higher again I soared in light bubbles above the valley wind before crossing to the southeast of Altdorf. I was very happy to find lift here among the breeze which was sliding off into the main valley. Touching cloud base again I pushed towards Klausenpass, finally sinking into oblivion as I tried to cross to the sunny side but things had shut down and I landed at Unterschachen just after spotting another cable. 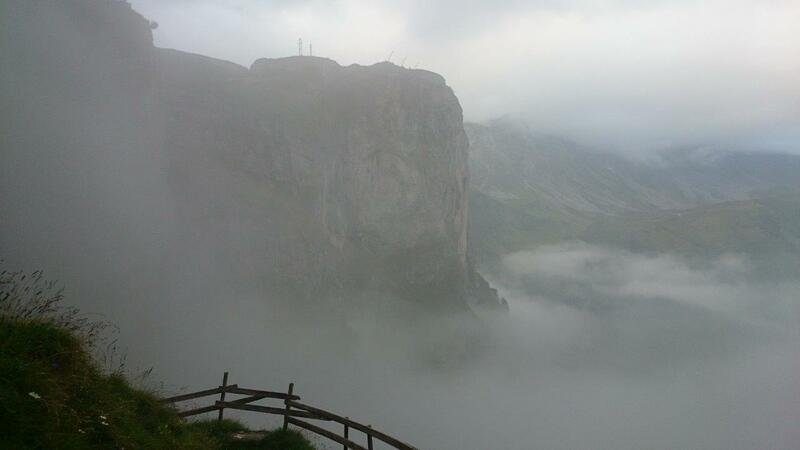 In the afternoon gloom I walked up towards the Klausenpass. Again it was very cold and cloudy in the morning. I was up at the pass early so waited 1-2 hours before launching. I glided out to soar along sunny cliffs which were topped with cumulus below the height I’d glided from. It was really beautiful and enjoyable but the first thing on my mind was avoiding the difficult to see cables. No effort is spared to bring a few blades of grass down from the high pastures, and I am told that any cable below 100 metres height is exempt from any bureaucratic process. This is of course the most dangerous height for us as we scour the cliffs for lift. Having dodged at least a dozen cables and almost into the main valley (Linthal), I swerved to dodge a cable only to see another on a different angle in front of me. It is very difficult to judge the distance from a single glance so you are always looking up and down to try and identify the location. Unfortunately many of these wires simply come straight out of the ground with not even an inconspicuous pole to mark them. While turning sharply the side of my pod harness hit the second cable and my fears were realized. I fell down and for a few seconds the end of my left wing was hanging on the cable. Once free I completed a short sequence of wing recovery maneuvers before flying again. Of course the first thing on my mind was not hitting the other cable, or the one I’d just hit, again, so I flew directly outwards, no guarantees but luckily it was ok. I continued flying a little more but with a couple of broken lines now the glider pulled slightly to the left. Not really wanting any compromises to my wing when there were more invisible cables to avoid, and not finding any thermals amongst the anabatic lift, I landed a short walk from Linthal. Another dental floss repair job and I ran to meet a Freestyle 2 pilot I’d just seen land. 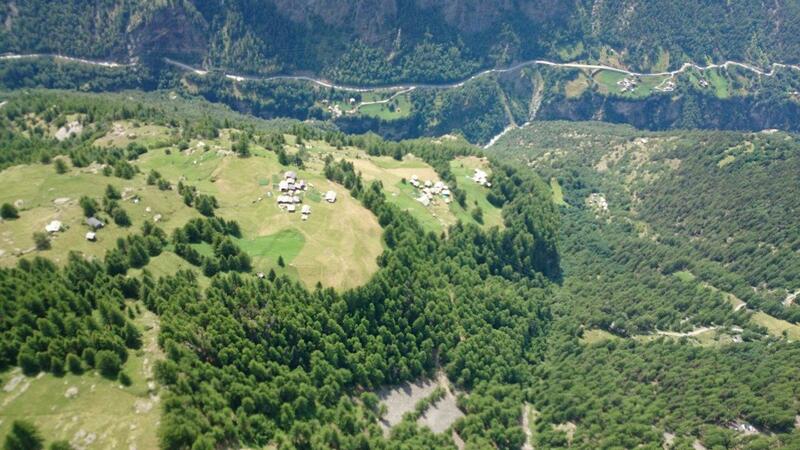 He told me about a paragliding shop (Robair) in Mollis, and the state subsided cog railway to the flying site. 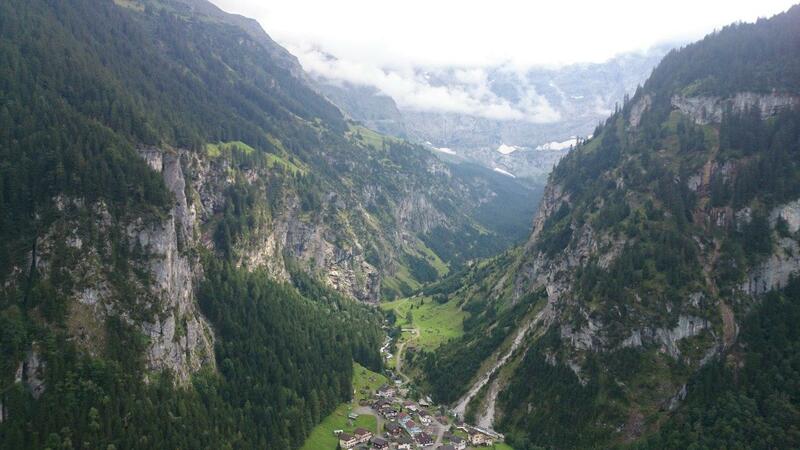 The town of Braunwald, like Zermatt, has no car access. I wondered if there was any Swiss village with no cables! I reflew but as I found it impossible to get away from the valley wind I took the opportunity to take the train to Mollis and repair my glider. The kind folks at Robair gave me a lift out to Walenstadt, the best place around to start an XC, if the weather hadn’t been completely miserable. There were moderate winds in the valley but the launch was light and variable under overcast skies. I relaxed and chatted to some of the SIV pilots, before taking an afternoon walk along the range, passing a small via ferrata route. After a couple of passing showers I reached the high pass in the early evening, and the wind was picking up ahead of approaching showers. I had plenty of time but squandered most of it trying to launch as alpine flowers hooked my lines. Finally I got off and the showers were now much closer! To avoid getting wet I scuttled sideways along the range, ridge soaring as much as I dared along the way, the occasional raindrops urging me to get a move on. 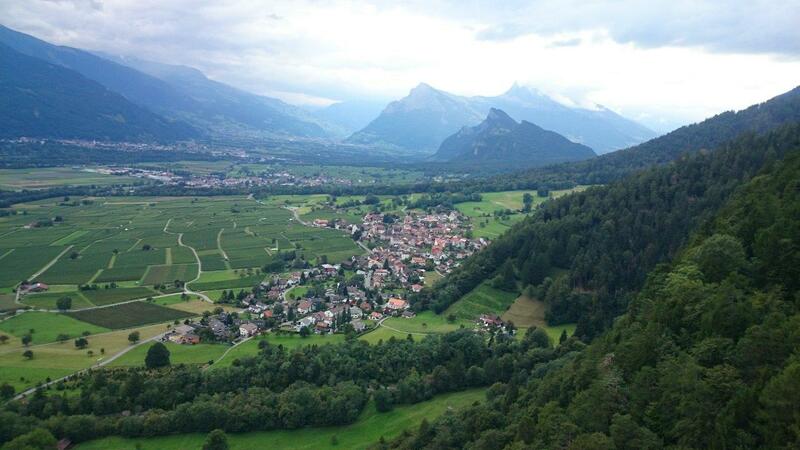 Finally I barreled over the back towards Liechtenstein and braced myself for the turbulence. High over the wide valley there was some turbulence as expected but I don’t remember getting any collapses. Everything was in shade and for the remainder of the flight I scratched in very light lift. It was rewarding to get enough height to slide away from Liechtenstein and finally to Malans, where the valley turns toward Chur. I walked up towards the well known flying site of Fanas, but unfortunately the next morning I was woken by rain. When the masses of cloud finally cleared for a moment I managed an evening flight into Austria, but in general I decided that I’d had enough wandering around in the clouds and wet grass for now. I’d had good luck with hitchhiking – that morning I was brought up a private road, and in the evening I was brought all the way to Feldkirch to an excellent hostel. The fast moving stratocumulus bank the next day and terrible five day forecast confirmed my decision. An awful August indeed but I was happy that I’d still managed to cover some ground and see some beautiful country with some memorable flights. 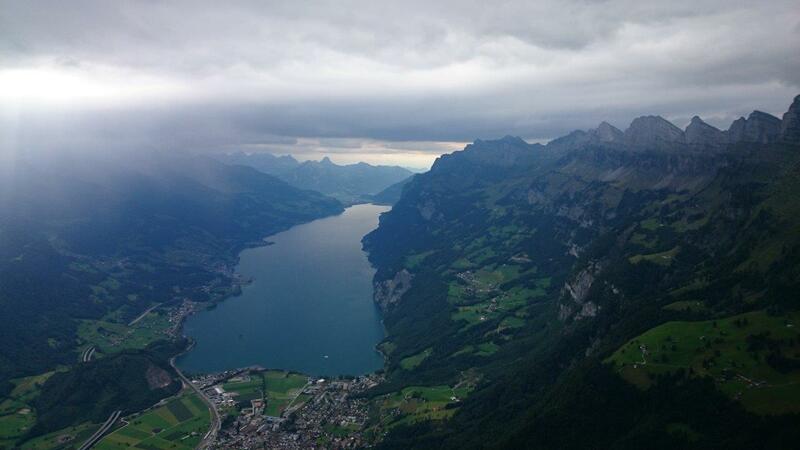 This entry was posted in Uncategorized and tagged adventure, europe, flying, mountains, paragliding, parapente, vol biv. Bookmark the permalink. beautiful sharing with all required information and i must say you are very daring man. well i really wish to visit switzerland and want to hv this experience.Your flight of rainy season in july and august and i dont have much experience of that seaoson.